By challenging the transmittance of meaning in her artistic practice, and problematizing the unreliability of the things around us and our experiences as her subject matter, Lutz Bacher uses different mediums and objects, and approaches different situations in her works. In other words, her works cover everything and anything. "Huge Uterus" (1989) is a video where artist's benign tumors are removed in an operation. A rather personal experience, this is almost a definition of the physical and material. Especially, when our bodies are becoming more and more political, or more precisely where we see our already politicized bodies exposed even more nowadays, a woman trying to know herself and confronting the viewer with her vulnerable situation by exhibiting the most private aspect of her own self and her "functional" organ, presents us with a work that is rather intimate in its artistic expression. 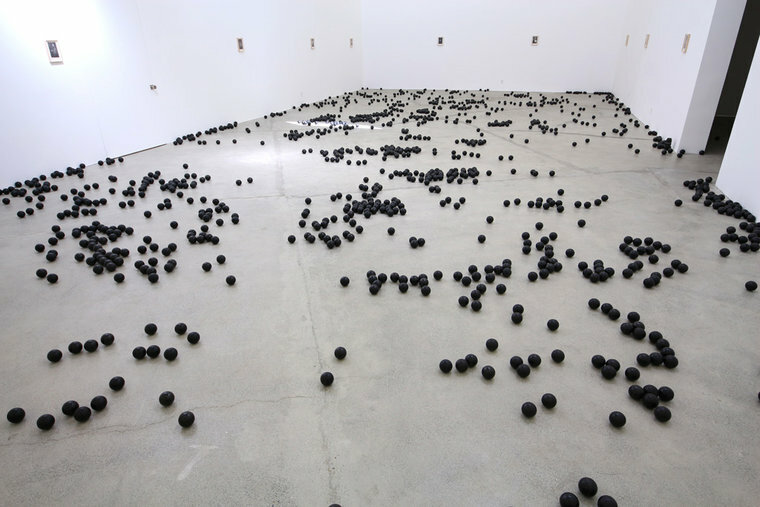 "Stress Balls" (2012) consists of hundreds of stress balls scattered around the floor. The work is simple and humorous; one wonders if the artist squeezed the balls when she was installing them around the gallery? Quite hard to predetermine, maybe refused to be determined, the work is an embodiment of order within dispersion, dissipation and organized chaos. In the video "Closed Circuit" (1997-2000), we see one of the art dealers, Pat Hearn who sells Bacher's work. The video, which Bacher recorded all year long via a camera she installed in Hearn's office and made a 40 minute video, represents a year of this woman's life. A reduction as well as a distillation of a situation, the video becomes almost a eulogy, after Hearn's unexpected death, and what we trace is a moving photo album based on these women's relationship with each other rather than a summary of it. In "The Celestial Handbook," Bacher tries to show something that doesn't belong to her. The work presents 85 pages of the handbook of the same title by the amateur astronomer Robert Burnham Jr. The book published in 1978 in 3 volumes consists of 2318 pages. Listing and documenting 7000 celestial bodies, the book is the outcome of an incredible effort. 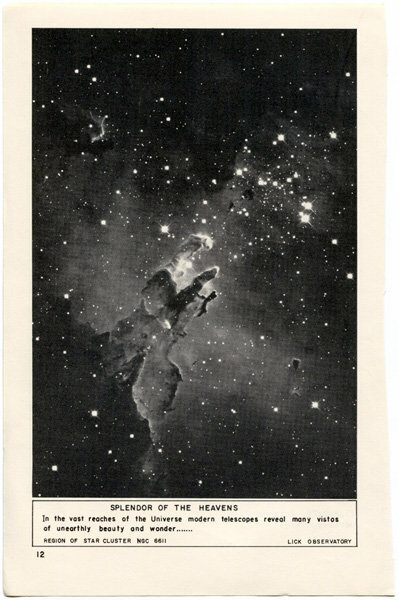 The captions in the book, which can be considered as a documentation of Burnham as an amateur astronomer, represent a tension between language and what is observed. In other words, this gap between what Burnham sees and what he can convey about what he sees is the epitome of the book itself. Each of the visuals is a confrontation with the universe; the book can be considered as a far more humble version of celestial bodies than what we visualize. The fact that monochrome photographs creates a visual coherence and a plain narrative, contrary to our contemplation of space. What Burnham, captioning his photographs by underlying that recording of the experience is always partial, observes is sometimes solely information and other times poetic; he apprehends the failure to satisfy one's desire to the narrate things and experiences. Bacher's gestures in giving something prominence, exhibiting, displaying, uncovers two different instincts by addressing these photographs which appeal to people interested in space as a pastime: firstly, the artist achieves an individual but equally undetermined visual and conceptual repertoire by displacing the words and images, and secondly, the simple pleasure in amateurship and sharing the fruits of one's resolution. The obscurity of material and subject in Lutz Bacher's work, the equal remoteness of her approach to her own body, her friend Pat Hearn, astronomy, amateurism, pictures and language, her methodization of sentience and lyricism with conceptualism in her approach, suggests that her artistic practice is primarily based on ideas about the essence of art and impetus of artistic production rather than visual or thematic affinities. In other words, Bacher's works on disassociation, deal actually with artistic production, artistic expression itself.